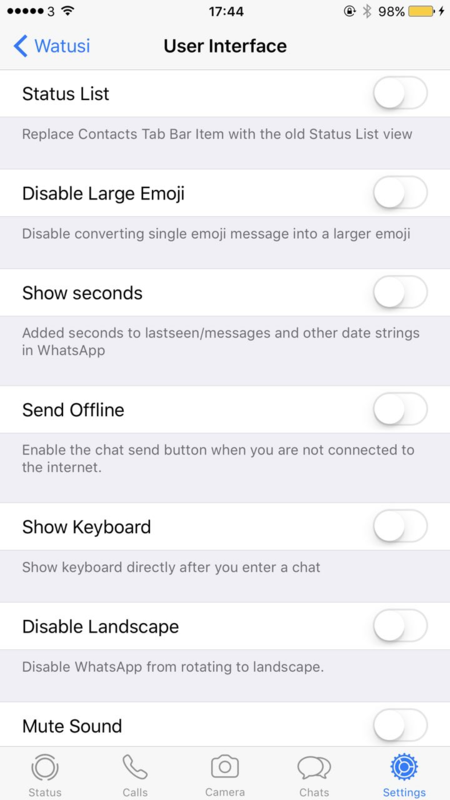 Watusi is your all-in-one tweak for WhatsApp messenger. It allows you to enhance and customize WhatsApp the way you like while protecting your privacy with a wide range of features. 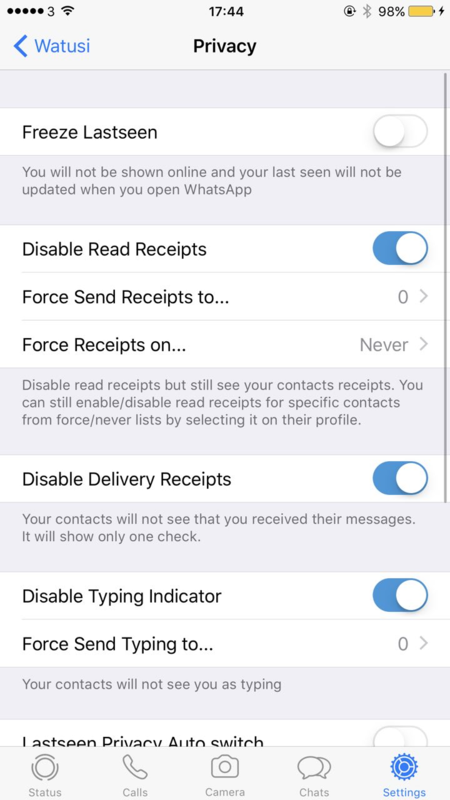 Filter your contacts list sent to WhatsApp in order to block some users from checking your picture, last seen and status. Disable VOIP interface and block incoming calls. 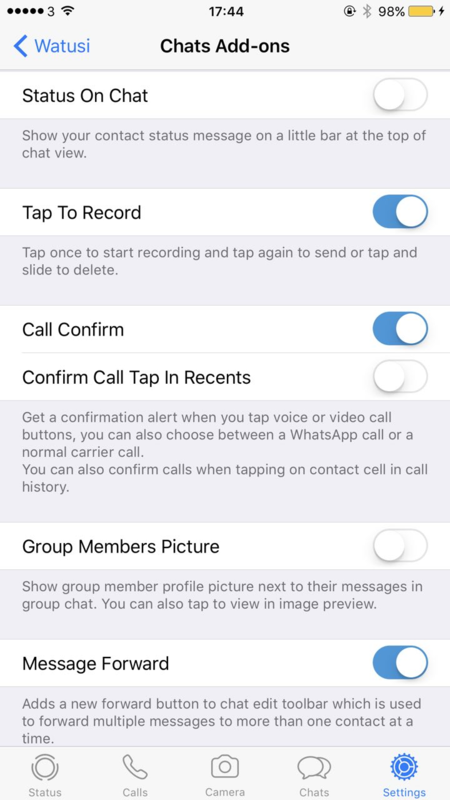 Protect your chats with a passcode and TouchID by swiping on the chat from chats list. Change your share sheet style by adding new options to it such as sending music or blocking your contact. Different share sheet styles including a sheet with an image picker to directly send an image. Auto save your incoming media into a custom camera roll album. Select unlimited number of photos to send at once. Delete all chat's media in a single button. Tap once to record voice messages without holding. Add your contacts' status on top of their chat. 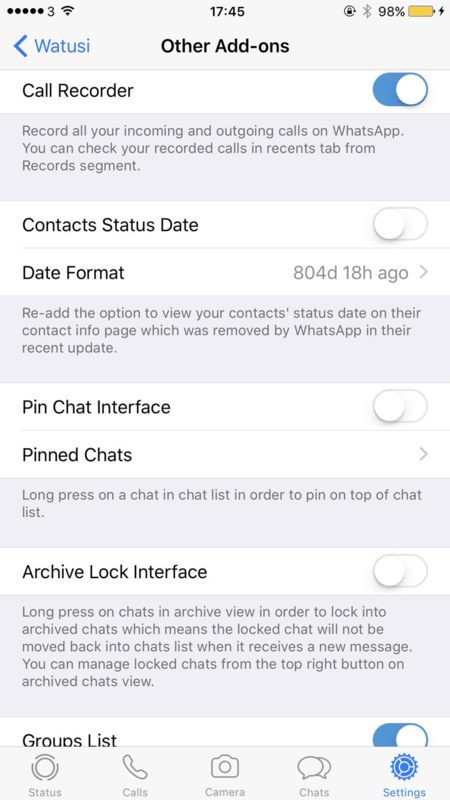 View your contacts' status change date. Pin your favorite chats on top of the chat list. Lock chats in archive so it does not move back to chat list on new messages. Show all your groups in a single page. Show confirmation alert for call buttons including the option to call via your carrier. View members profile picture in group chats next to their messages. Open your contacts picture when tapping on their thumbnails. Open a new chat using a phone number without the need to add it in your contacts. Open links in an In-App browser. Long left swipe on a cell to delete it. Replace mark as read right swipe with your contact info. Replace contacts tab bar with old status list view. Disable large emoji size in chat messages. Enable send button in chats while offline. Show keyboard when opening a chat. Disable landscape rotation in WhatsApp. Mute sending message sound and key clicks. Hide your contact profile picture from top right of their chats. Hide camera button from input bar. Hide call button from top of chats. Hide status bar inside WhatsApp.